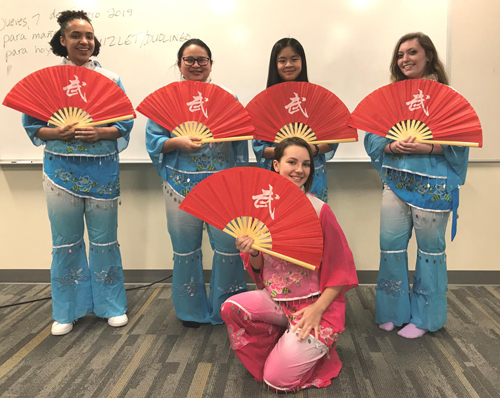 The Chinese Language and Culture classes at Heights High celebrated the Chinese New Year during the week of February 11 with three activities that gave students a taste of the Chinese New Year, celebrated by people across the globe. Students created posters depicting several aspects of Chinese culture, including festivals, art, medicine, government, fashion, and the wedding tea ceremony. Students displayed their projects in the library and participated in a gallery walk for students to view all the posters. 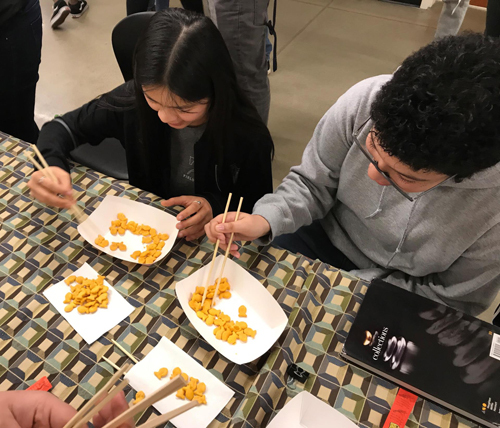 Throughout the week, Chinese students hosted fun hands-on activities in the cafeteria to share Chinese language and culture with other students. Activities included Chinese Opera Mask making, chopsticks contest, Chinese character paper cutting, painting images of pandas, and Chinese calligraphy. These activities taught other students the cultural importance of Chinese art. Dr. Lin's students facilitated the activities and invited students to participate in them. Students hosted an after-school performance in the Mini-auditorium that featured many aspects of traditional Chinese New Year celebrations. Audience members included students and the parents of many of the performers. The Lion Dance opened the event, it is often performed at the opening of most major celebration events in the Chinese community. 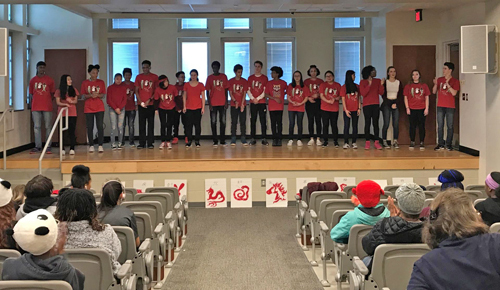 Students also demonstrated language proficiency as they sang several folk songs including the Grateful Heart, Months, Jasmine Flower, Happy Chinese New Year and Gong xi, Gong xi. Students learned about both modern and traditional forms of Chinese dance with a fan dance and TFBoys Manual of Youth. In addition to the dances, students performed Martial Arts: Kung Fu and Tai Chi. Audience members participated by playing Kahoot on a big screen above the stage. This is an online quiz game about Chinese Zodiacs and Chinese New Year traditions. Everyone received prizes - mandarin oranges and red envelopes with candy and lucky phrases to wish students and audience members a good year. Dr. Shu Hui Lin is the Chinese Language and Culture teacher and was happy with the event. 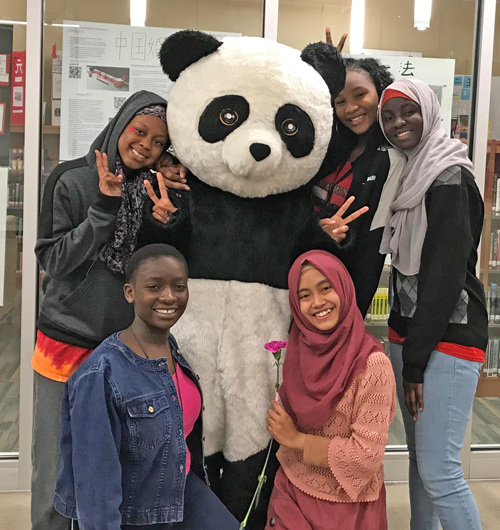 "I was pleased with the students' performance and they were excited and proud of the work they displayed to the school and community," said Dr. Lin. Dr. Lin was also very happy with the positive input from parents and staff about the showcase and performance. She is looking forward to expanding next year's celebration. Dr. Lin would like to thank the parents of her students, the school administrators, teachers, and staff for the support, the Heights Schools Foundation for the Shark Tank grant and the Confucius Institute at Cleveland State University.